The generation of filmmakers who grew up after WWII came to revere the directors of the studio era. Scorsese, Bogdanovich, Fassbinder, Godard, all had tremendous respect for the guys who worked under contract, took the scripts that got handed to them, and still managed to turn out movies that were personal and passionate. The director who has probably gone farthest in exploring his relationship to that older generation is Wim Wenders. It’s not uncommon in films made from the 70s on to see cameos by the studio veterans. 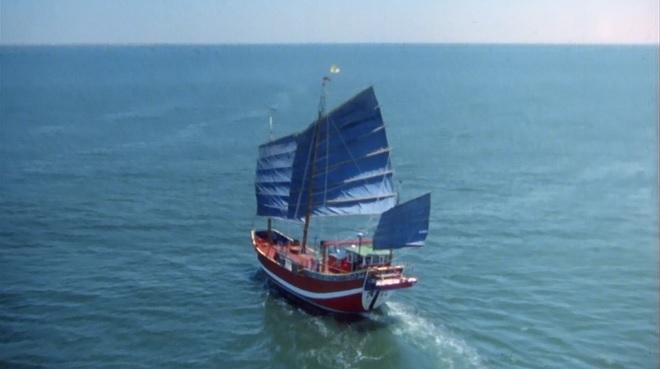 But Wenders didn’t just have these guys do walk-ons. He made them a part of his cinematic world. For him, putting Sam Fuller in The State of Things wasn’t just a nod to a mentor. It was a sign of friendship, and a statement about the continuity from one generation to the next. Another filmmaker that Wenders was close to was Nicholas Ray. 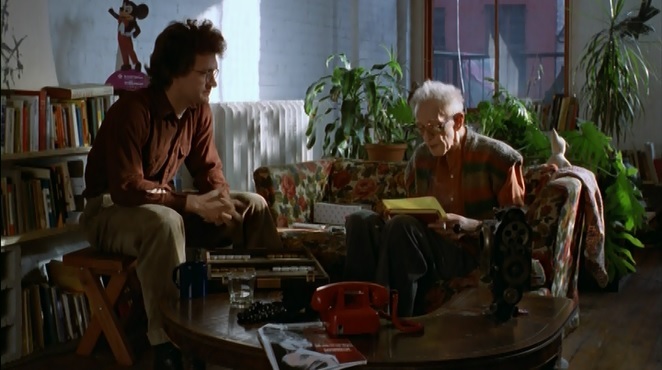 The older director had already appeared in Wenders’ The American Friend. They had not known each other long when Ray was diagnosed with cancer. Within a year his health had deteriorated to the point where it was clear he didn’t have long to live. And that was when they decided to make a film together. Lightning Over Water isn’t really a documentary, though it is a document. It’s not fiction either, though the people who appear in it do act out scenes. It doesn’t fall into any category, and it’s about many different things. You could say it’s a film about filmmaking, and also about art. Fear pervades the atmosphere throughout, but love is just as present. And death is always just beyond the horizon. While both men are credited as directors, it’s clear that Wenders is leading the way. Ray is so weak that it’s sometimes hard for him to finish a sentence. He’s wracked by coughing fits. Just lying down in bed is so painful it makes him cry out. And because Wenders realizes that he’s the one in control, he’s overwhelmed by the responsibility. At the very beginning he tells Ray that he’s afraid of exploiting him. Ray dismisses the idea, but it’s clear that Wenders is extremely uncomfortable with this project. He shouldn’t have been. You can hear the joy in Ray’s voice when he first greets Wenders. This frail old man shouts from his bed, “I’m ready to start work again.” Even if the line was written out in advance, it’s clear that Ray means it. Toward the end of his career he turned to teaching because Hollywood wouldn’t give him backing to make another movie. While he kept himself busy with other projects, he always wanted to get back in the game. Now, when he knows he’s dying, he’s got one more opportunity to make a film, and he’s determined to seize it no matter what the cost. Ray enjoying his first cigarette of the day. Ray seems completely at home on the screen. In spite of his weakened, wasted frame, he shows no sign of self-consciousness. He allows the camera to see him at his worst, and never shies away. There’s a strange beauty in this “performance”. He’s confident, even defiant. We can see where many of his onscreen protagonists got their swagger from. 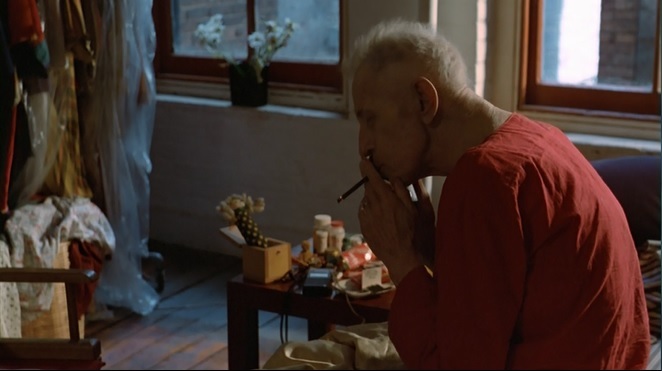 This is a man who’s dying of cancer, and the first thing he does on waking up is light a cigarette. You want to grab it out of his hand and throw it away, but you also know that would be pointless. He’d just light another one. Wenders voicing his concerns to Ray. 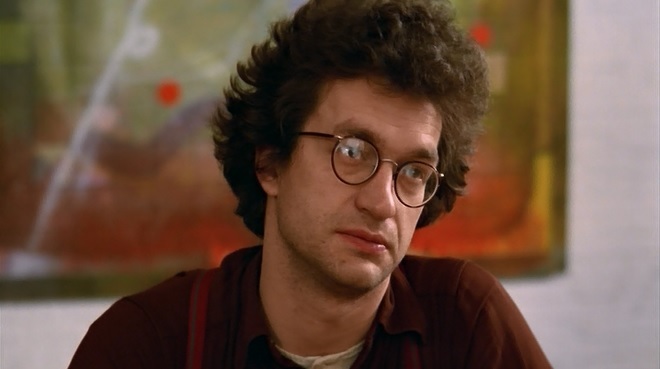 Wenders, on the other hand, is extremely uncomfortable in front of the camera. Aside from the fact that he seems stiff and awkward, you can tell that making this movie was an awful ordeal for him. It’s bad enough that his close friend is obviously very near to death. On top of that, Wenders is constantly concerned about invading Ray’s privacy and sapping his strength. The younger man wants to stop the whole crazy thing. The older man keeps insisting that they forge ahead. As I write this, I realize that the audience for this film is very small. Only the people who know Ray’s work, or know Wender’s work, could possibly be interested. It doesn’t have a story, it doesn’t offer a clear-cut resolution. The film jumps unpredictably between reality, fantasy and the hazy netherworld inhabited by the people who stand behind the camera. 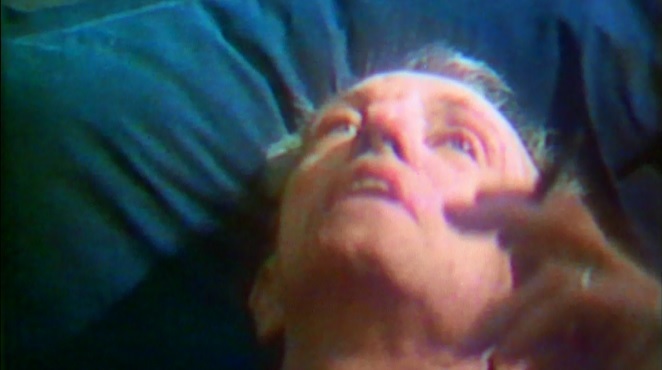 On top of that, it’s a very intense, very painful look at a man who’s dying before your eyes. But it’s also a testament to a friendship that was stronger than death. And a moving portrait of two men who loved each other very much. Posted on August 20, 2015, in New York, Non-Commercial Cinema and tagged New York, Nicholas Ray, Wim Wenders. Bookmark the permalink. 1 Comment.